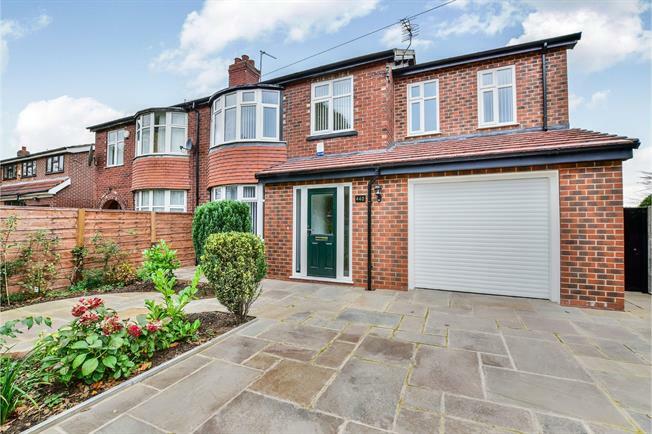 4 Bedroom Semi Detached House For Sale in Cheadle for Offers Over £400,000. Offered with no onward vendor chain - a truly immaculate four bedroom semi detached home. Having been modernised throughout to the highest of standards the property also boasts of an extremely useful and generously proportioned open plan kitchen and snug room extension. If you are looking for a four bedroom property then this is an excellent property for you. The property briefly comprises - entrance, large lounge, downstairs WC, large brand new fully fitted kitchen with Velux window feature and attached snug room, large utility room and integrated garage. To the first floor you benefit from 4 good sized bedrooms, en-suite and family bathroom. Externally the property benefits from driveway, front garden, good sized private rear garden with Indian stone paving and grassed area.